Certified home compostable caddy liners made entirely from plant ingredients. These strong liners hold 10 litres and are tear resistant even when wet. Vegan Society Approved, Cruelty-Free International Approved. Made in the UK. 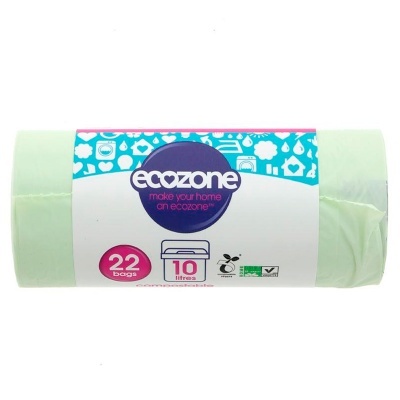 Ecozone Compostable Caddy Liners. 100% compostable and biodegradable, made entirely from plant ingredients. These strong liners hold 10 litres and are tear resistant even when wet. These caddy liners are Vincotte – OK home compost certified. They are made in the UK and are also certified Cruelty-Free and vegan.